Students at John Paul II High School in Dallas discuss immigration during the campus-wide Solidarity Week. Students at John Paul II High School in Plano sit around a table. They're dressed casually in t-shirts and hoodies, jeans and sneakers. The conversation they're having, though, is not so casual. Sophomore Manasa Srinivasa asks her classmate John Wittemore what he thinks is the most interesting thing he learned during the school's Solidarity Week. "I didn't realize that the immigration system was so complex and that, like, people have to wait 20 years to even get an interview to, you know, become a citizen," John said. Getting Manasa, John and other students to open up and dive into a complex or even polarizing topic is the goal of the school's Solidarity Week. Last year, students focused on racism. It's part of the "Be Golden" campaign launched by the Catholic Diocese of Dallas. The diocese has partnered with the city of Dallas and other groups to spread a message: follow the golden rule and treat others the way you want to be treated. "We look to the teachings, the fundamental teachings of the church, and the gospel and the way we are to respond to our neighbor, and we let that be our jumping point," said Sammy Argumaniz, director of Campus Ministry and Catholic Identity at John Paul II High School. 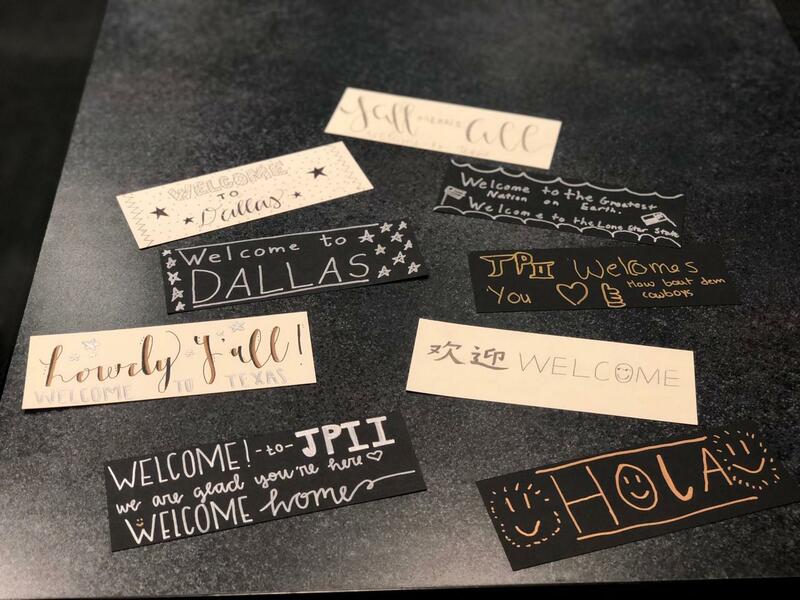 Students created welcome messages as part of the Be Golden campaign of the Dallas Catholic diocese. The notes will be displayed around North Texas. The lessons students are learning, he said, are rooted in the Catholic teachings of solidarity. "Immigration is first and foremost a human issue and, in particular, we want to live that solidarity on campus," Argumaniz said. Senior Eugenio Montemayor is one of nine students and staff who shared a personal immigration story. He said he wanted to clear up misperceptions about Mexican immigrants. Eugenio was born in Monterrey and lived there until he was 10. His family came to the U.S. in part because of his dad's job, but there were other reasons for the move. "We received, you know, like, multiple threats and it was just … it became very unsafe to live there so…we had to move. Even close family friends had been kidnapped and a lot were brought back safely, but there were a couple that were murdered," he said. During the weeklong symposium, the Most Rev. Edward J. Burns, bishop of Dallas, and immigration attorneys spoke to the students. Attorneys George and Michelle Rodriguez offered a lesson in immigration law. The husband and wife team sit on the bishop’s immigration task force. George Rodriguez told students it doesn’t matter where they stand on the hot-button issue. What's important is coming together to talk about it … and building a common understanding. "Why is this conversation so important?" Rodriguez asked. "Because the conversation that is taking place right now in our country is so polarizing. We've become so tribal. The narrative that is being placed out there is very negative." Just the mention of the word immigrant, he said, can stir up hateful reactions. Rodriguez reminded students not to let the debate over the border wall overshadow the lessons learned during Solidarity Week. "It's not about a specific policy. It's not about the wall. And it's definitely not about open borders," he said. "It’s about treating people with dignity, treating each other with humanity. Understanding that there are certain things within our Catholic faith that we believe in." Rodriguez said people can be Catholic or not religious at all and still treat people with compassion. Edward Burns led his first Easter mass as the bishop of the Catholic Diocese of Dallas last weekend. He moved from Juneau, Alaska, a few months back, and he’s already making a mark. He started a task force on immigration and is leading a national effort to prevent sexual abuse in the church.